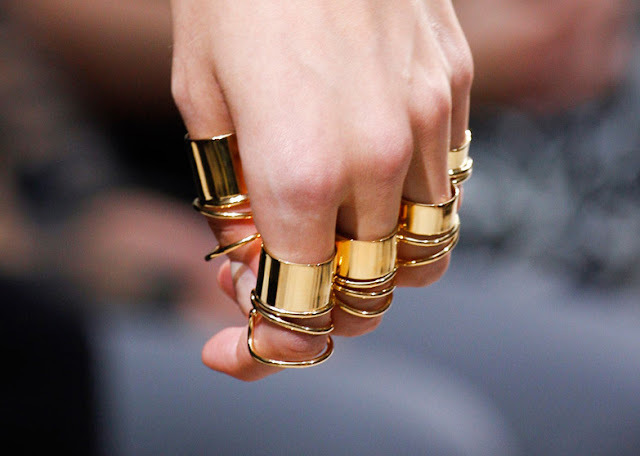 I know Margiela did the whole gold knuckle duster ring already and it's been and gone but Balenciaga is bringing it back in with more gold echoing the thick knuckle duster and although there is more gold, the thinner rings gives it more WOW-power (Def. an object which makes one go WOW) than KER-POW (Def. the sound that is heard when one has just taken a hit). Made me go WOW too Jen! I know what I'll be DIYing this weekend! oh man these are so cool! OMGGG I want these so badly! Where can you buy them?